SNL is now accepting submissions for the 11th Annual Society for the Neurobiology of Language Meeting. You must be a current member of SNL to submit. The submission fee is $40.00. The deadline to submit an abstract is April 19, 2019. To submit an abstract, please Log In to your SNL Account or Create a New Account. For more information about submitting an abstract, please visit the the SNL website. 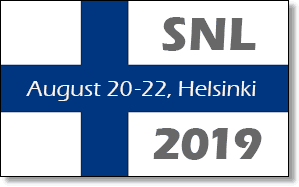 SNL 2019 will be held in Helsinki, Finland, August 20 – 22, 2019 at the Finlandia Hall.